Art is one of those topics I love to think about, but find difficult to teach. I found ARTistic Pursuits when my girls were young elementary students, and have loved it ever since. This year we had the opportunity to review a brand new book: Sculpture Technique: Construct, intended for students ages 11-18. ARTistic Pursuits provides homeschool art instruction for ages Pre-K through high school. Last year we reviewed Book 1 from the Middle School level, The Elements of Art and Composition. It was a lot of fun, and the girls learned a lot. The Sculpture Technique book is completely different from anything we've done before. We were definitely working outside our comfort zones, but in a good way, I promise! Brenda has a knack for clear instruction. She really does think of everything. When I read the instructions to make paper, she even listed "power source," lest I do something bright and take the blender where there was no plug for it. You know, I could see that happening in the name of trying to keep the mess out of the main area of the house! She can't make us as talented as she is, but she certainly gives all the tools we need to figure things out, and how much time we choose to practice and improve our skill is on us. The book suggests setting aside 1-2 hours per week for lessons, and states that it will probably take more than one session for each lesson. That is the truth. It takes time to make paper; there is no getting around it. And 3-dimensional constructs don't just appear out of thin air. There is a fair amount of trial and error involved, and you have to be willing to start over when things don't go just right. Let me tell you, thinking in three dimensions definitely had us working outside our comfort zones! 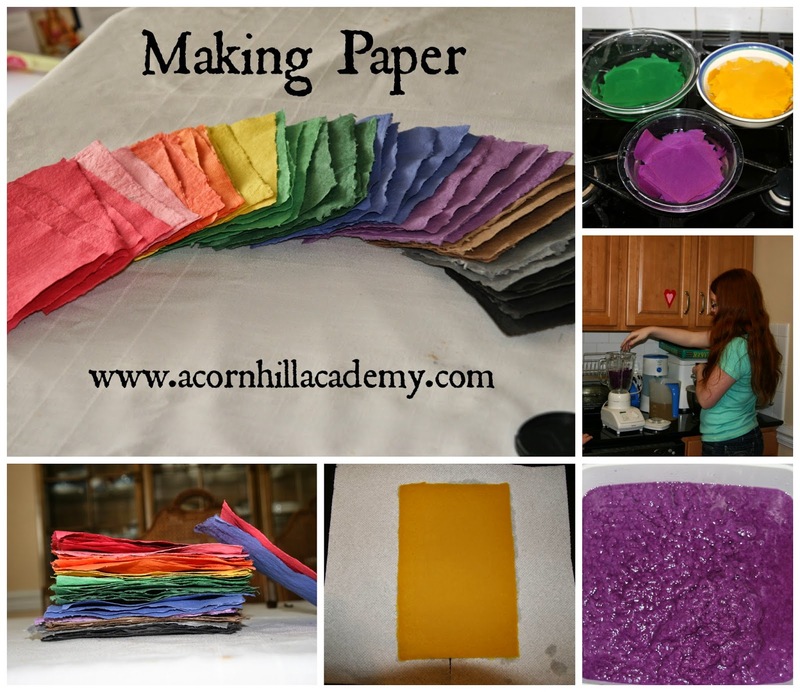 First, we made a rainbow of paper. My girls were so funny - they did what I asked without complaining, but when my husband got home they showed him and said, "Look, Dad! We made PAPER! Out of PAPER!" and proceeded to laugh like it was the silliest thing they'd ever done. Bless their little pea-pickin' hearts. I think they began to understand why we had to make paper when we mixed some new colors. I didn't have any specific colors in mind, but thought I'd try for a darker brown once, and then decided to see what would happen if I put the remaining black in with the rest of the blue, and it just blossomed from there. This, in itself, was time consuming. We were able to dry the paper in the microwave, so that saved needing to let it air dry for a few days. Once we got the paper made, it was time to create! I had to just walk away and let the girls do what they wanted on their own, because they couldn't decide and I am prone to telling them what to do. It took them a bit of effort to grasp how to get portions of their pictures to be three-dimensional. It took some stops and starts, and a few attempts, but they figured it out. 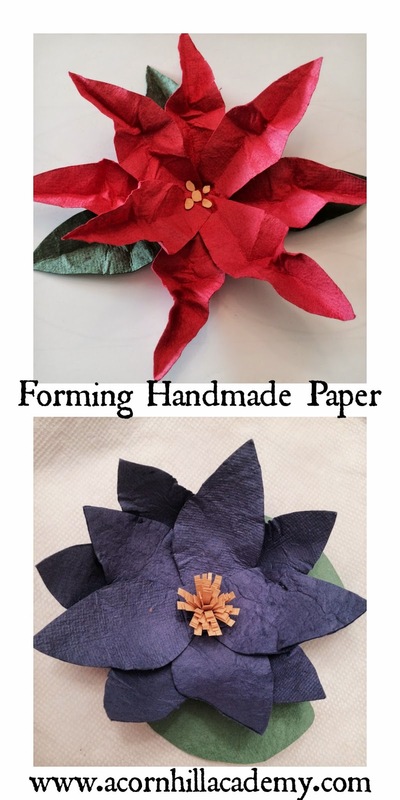 Then, we moved on to forming hand-made paper into three-dimensional constructs. That was fun! I made a poinsettia, and Abbie made a lotus. We cut dry paper into petals, and then sprayed it with water and formed it into our flowers. And then, we moved on to wet paper construction. I will say I struggled the most. The project was to make a mobile using figures we fashioned from wire, then using wet paper to cover the forms and make clothes for them. I made the little wire people with much trial and error. I failed completely at making thumbs. I had a hard time figuring out how to get the paper to go on to the wire, and ended up calling Brenda, the author, who talked me through it. She was very helpful and encouraging, and definitely wants people to be successful. The girls actually did much better with this part than I did. We haven't quite finished our mobiles, but we have a good start on our wire figures. If you have a student who loves to create on their own, they could certainly do the work in this book independently. My girls prefer me to work with them, so when I am able to do that, I try to sit down and make projects alongside them. Often I can get them started and they are able to finish up independently. I am certainly no expert, and we learn together, which is the best part of homeschooling for me, anyway. Sculpture Technique: Construct is available from ARTistic Pursuits for $47.95, which is a great price for a year's worth of art instruction for your homeschool. 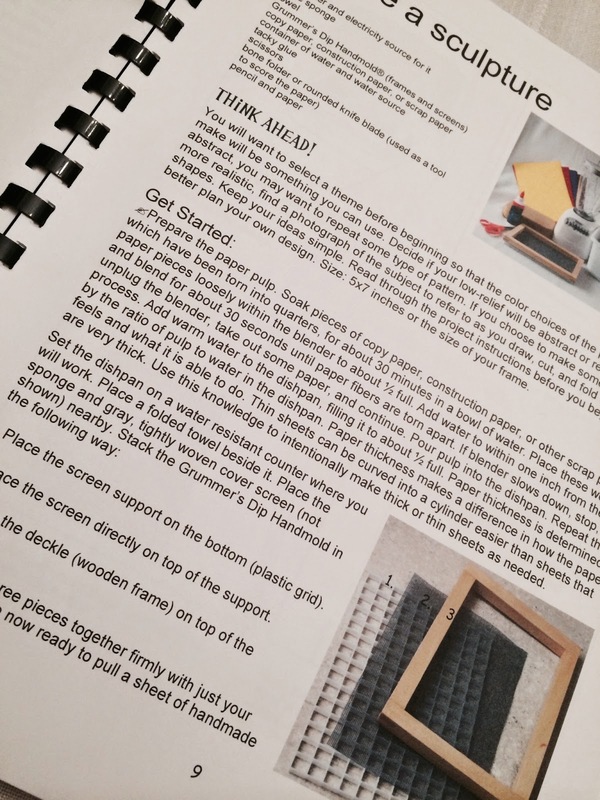 Each book in each level is the same cost, and has a specific list of the supplies you will need. If you're looking for quality art instruction for your homeschool, I encourage you to take a look at ARTistic Pursuits! Connect with ARTistic Pursuits on Facebook and Pinterest.